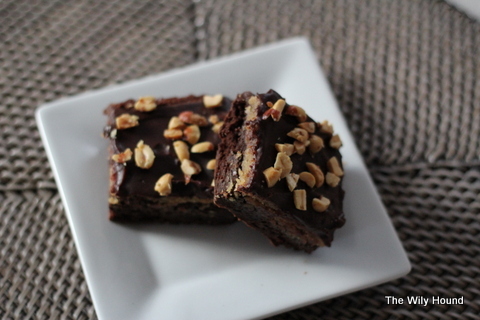 I had brownies on the brain on Sunday, but not just any brownies – fancy brownies. I wanted to jazz up my regular brownie recipe and make something a little different, so I turned to the best source I know: Pinterest. I found a bunch of ideas that are currently impatiently waiting on the back burner, but I eventually succumbed to the siren song of a peanut butter cookie dough brownie, and boy-oh-boy am I glad I did. Justin described them as tasting like a homemade Reese’s peanut butter cup and I have to agree with him. The peanut butter filling is amazing and compliments the fudgey brownie base and the smooth ganache top so well that I’m pretty sure I saw Justin weep, though he would probably deny it. These brownies take a little extra effort (especially if your microwave starts sparking and catches fire during step #1 and you have to melt everything else on the stove like a caveman like I did) but they’re worth it. The brownie recipe that I used is a “light” version from America’s Test Kitchen (2 tablespoons of butter as opposed to 8) and I think that they’re even better than regular brownies, but you can use whatever recipe (or box mix) your heart desires. 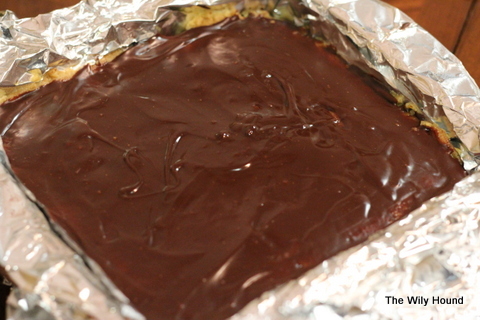 And I didn’t have any dark chocolate for the ganache, so I used semi-sweet and it worked beautifully. Also, I tried out a new technique this go-round, which was to line the pan with tinfoil and leave some hanging over the edges and then when the brownies were cooled, I lifted them out of the pan and transferred them to a cutting board. It was so much easier than cutting them in the pan and trying to dig the first one out without ruining the batch. Good to know! Adjust an oven rack to the middle position and heat the oven to 350 degrees. Line an 8-inch-square metal baking pan with parchment paper or foil, then lightly coat with vegetable oil spray. Whisk the flour and baking powder together in a small bowl and set aside. In a separate bowl, whisk the cocoa, water, vanilla and espresso powder together and set aside. Microwave the butter and chocolate together in a microwave-safe bowl until melted, about 1 minute, stirring often. Whisk in the sugar and salt until completely incorporated. Whisk in the cocoa mixture until combined and then whisk in the egg. Stir in the flour mixture until no streaks remain (do not overmix). Pour the batter into the prepared pan and smooth the top. Bake until a toothpick inserted into the center comes out with a few moist crumbs attached, 20 to 25 minutes, rotating the pan halfway through baking (do not overbake). Cool completely on a wire rack, about 1 hour. Add the butter and brown sugar to a large bowl and mix until creamy. Mix in the milk and the peanut butter, then stir in the flour and salt. Spread the peanut butter cookie dough evenly over the cooled brownies. In a small microwavable bowl, microwave the chocolate chips and cream, uncovered, on high for 1 minute, stirring after 30 seconds. Continue stirring until the chips are melted and the mixture is smooth. 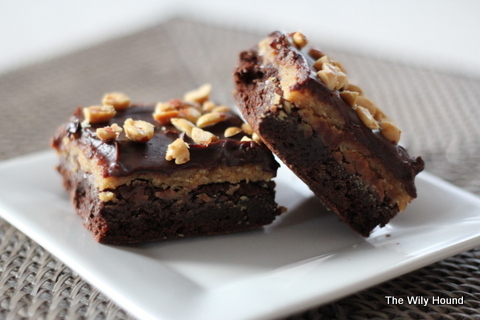 Smooth the peanut butter layer over the cooled brownies and then pour and smooth the ganache over the peanut butter. Top with chopped peanuts and refrigerate until the peanut butter and ganache are set, about 1 hour. Chris will go nuts for these!